Colic is a term used to describe all types of abdominal pain in horses. It can affect horses of all ages and types, and can vary from a mild bout of discomfort that resolves itself to something more serious that requires medical management, or most dramatically a serious abdominal crisis requiring surgery. Every year hundred of horses lose their lives to colic, with some high profile top competition horses among them. Most colic cases are successfully cured medically, but between 5-10% will require emergency colic surgery. It is difficult to know which colic case fits into which category, as in the early stages the clinical signs are the same (see below). Therefore it is vital that a vet is called promptly so they can give expert advice and start appropriate treatment as quickly as possible. Any colic that requires surgical intervention has a much better chance of success if surgery happens as soon as possible. There are many different types of colic that horses can suffer from. the list below is not exhaustive, but covers the most common examples. 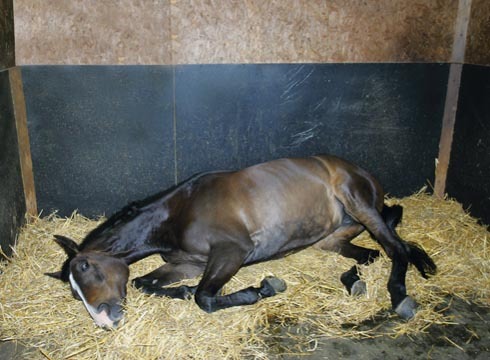 Spasmodic colic: Also known as gas colic, pain is caused due to a build up of gas in the horse’s gut due to excess fermentation within the intestines or a decreased ability to move gas through it. It is commonly caused by a change of diet, a lack of roughage or parasites. The clinical signs are generally mild and respond well to pain relief and spasmolytic medications, such as buscopan. Impaction colic: This is when a blockage occurs in the intestine. It typically responds well to medical treatment in the form of pain relief, fluids and laxatives, but some cases will require surgery. If left untreated, severe impaction colic can be fatal. Sand colic: Most typically seen in horses kept on sandy pastures, especially when there is limited grazing available. The horse ingests sand (and dirt) which accumulates in the gut. It can lead to an impaction or it can irritate the lining of the bowel, causing diarrhoea. The weight and abrasion of the sand or dirt causes the bowel wall to become inflamed and can in severe cases, leads to peritonitis. Twisted gut: There are various parts of the horse’s gastrointestinal tract that may twist upon itself, leading to an interruption in blood supply to that section. A twisted gut is extremely painful for the horse and requires emergency surgery. Tumours and previous damage to the gut wall caused by parasites can also result in colic. Frosty grass: will eating it give your horse colic?